Ifish Christmas Roll Call, 2002! A new annual event that benefits Emanuel Children's hospital! I was up most of the night, worried about ifish being down. It went down at 5:00. I had vivid dreams of the techs calling me on the phone to tell me all kinds of horrible things. "We lost all data". "Jennie, wake up! Seasurf burned to the ground!" At 1:00 A.M., I woke up, and realized it wasn't so. I strolled over to the bathroom window and flashed the flashlight out onto the meadow. Not a sign of life. No deer, no elk. Everything was calm and peaceful... but was ifish fixed yet? I was too tired to go check. I went back to bed and pulled the covers up to my chin. Finally, I fell asleep again. Must have been about 3:30 or so. The alarm went off at 4:30 and I woke Bill up. "There is no way I can go duck hunting, Bill", I groaned. I was so looking forward to going. So, with a very excited Dee Dee, I heard Bill holler downstairs, "Dee Dee, ducks!" and they left, with a slam of the door. Dee Dee was barking the happy dance. Poor Kilchis thought he was going too, but was stopped short at the door. Bill can't handle two dogs. Especially since Kilchis has no clue what he is to do, yet! I couldn't get ahold of anyone last night when ifish went down. Don, who owns Seasurf, was at the USC game in California. His step son plays for Notre Dame. I can just imagine his frustration when he found out we were down, right after a crushing Notre Dame loss! Double whammy! We are back up and all is well. I'm going Duck hunting on Wednesday, instead. Until then, I owe Kilchis. We are going out to the river this morning to pretend we are Merganser hunting. It's legal right now, you know. Wow! Look what ifish was gifted with! Enter to win a trip with Terry Mulkey! Thanks, Terry! 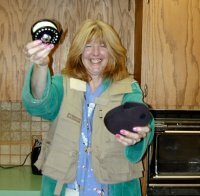 At the age of four, my Mom took me into the Oregon City Eye Clinic for an evaluation. She told the doctor that she never needed to hire a baby-sitter. Jennie would sit at the piano for hours, without interruption, yet, when Jennie tried to read the music, she would lean way over, two inches from the book. It was on that day, high up in the Oregon City hill, that I was diagnosed with Marfan Syndrome. I had dislocated lenses in my eye, and all the other "marf like" characteristics. The term "Marfan" was foreign, and scary to a Mother of five. Four of them, perfectly healthy.. and then this? "Besides dislocated lenses, is there anything else we need to worry about?" The doctor reassured her that we would cross those bridges as they came. Whether from ignorance, or just not wanting to know, my Mom never crossed that bridge. I crossed that bridge, alone. Walking into a doctor's office, I learned "the rest of the story." I'll never forget the day when a young med student informed me that Marfan syndrome would kill me before I was 35. Truth or not, it stuck with me. OK! If I'm going to die young, I'm going to do whatever I please! Do what I pleased, I did, I danced carelessly through life. Like a free spirit, I hopped from piano to art, from college to private study, from playing in bars, to playing for Presidents, and government officials. For fun, I'd spontaneously drive from Portland to LA, in the middle of the night, just to visit friends. I dabbled in things I am not proud of. I dabbled in things I am proud of. You could find me dressed in jeans and waders on the river bank one day, or at The Washington DC Hilton in heels and designer dresses the next. My life included playing for churches around the United States from Texas to California, or... playing in gay bars in neon cities. Along the way, I picked up habits from both. One was faithful prayer. Another, an addiction to smoking cigarettes. I was surrounded by all types of people. I knew drug addicts, and many of them were my friends. I also encountered people so gifted by the faith in their creator that I was stunned, and envious. I took some time out of my mixed up, busy, and eclectic lifestyle, to settle down, get married and have children. When visiting my obstetrician, they told me that I couldn't have children. That it would be too much for my aorta, and I would die. I told him I could have children. I could do anything I wanted. I had two. Although my marriage did not last, my children and I have. It is at this point in my life, at 42, that I am taking a serious look at things. It's about time. Go figure. I'm still around. The doc was wrong, just as they had been about having children. Heck if I'm going to outlive their threat of me dying of an aortic aneurysm, only to die of lung cancer! It's a dreadful thought! So, with the courage I never thought I'd muster, I went to the doctor and got a prescription for Zyban. Zyban is a drug that is supposed to make it easier to quit smoking. I took it for 5 days, and it was the worst drug experience I've ever had. I was grouchy, moody, shaky, and it induced panic attacks. Not my idea of help. I don't know how I'm going to do it, but by golly, I'm going to try. I have never in my life, tried to quit smoking. Not even for one day. I never had a reason. I may be a grouch, I may be a terrible mean and ugly moderator on the board, but I'm going to be alive, by golly! This was extremely difficult for me to write... I have always been a closet smoker. Embarrassed of the habit, and always trying to hide it. From the friends that I have met on dark city nights, who can relate to the power of addiction, to the friends I have prayed with on bright Sunday mornings in church.... I ask for your support and prayer. Tonight is the night!!! I can't believe it! Looks like there will be well over 200 people at Pietro's tonight! What fun to see if they can keep up with our orders, as we hand over our Christmas presents to the kids at Emanuel Hospital! It will be a gala event for all! :) My Dad is even going to attend! 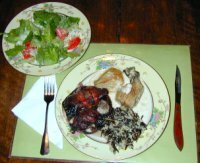 Last night, duck for dinner. I am in love with fennel, but dang that stuff is expensive! I had a great time yesterday with Kilchis, watching the chum salmon. Kilchis is the most amazing dog I have ever witnessed. Two things he does are very unusual, and I have never seen a dog do these things before. First off, he uses his front paws like hands. I swear, if he had posable thumbs, he would use them. He sees a dead chum on the river bank, in say 6 inches of water, and he goes in, stands on his hind legs, and grabs it with his front paws, and drags it in, while hopping, with his back legs. ??? Ever seen a dog do that? He'll spot a dead chum in three feet of water, and he swims out to it. He'll hover over it, trying to reach down to get it. He'll put his head, way down under water to try again. If that doesn't work, he'll just tread water over it, and whine! The other thing he does, is constantly crawl on top of Dee Dee. Kilchis stands on his rear legs, his front paws over Dee Dee's back, whenever anyone is getting attention, or we are getting excited about something. Dee Dee, usually not patient with other dogs, just puts up with it! Is this just the Alpha thing in some dogs? It looks hilarious! If you'd like to see pictures of the chum I saw yesterday, click here. Off to answer e mails, and then to prepare for the trip to Portland. I sure hope you are considering attending, tonight. It's for a great cause! Help! I have my new contact in the other eye now, so that I don't have anisophtrophia, or whatever it is called. Anyway, I went outside and the grass looks so sharp I'm afraid it will cut my wading shoes all up! Is it always this sharp looking for you? YIKES! What a scary world! "For those who don't know, I can tell you THERE ARE ANGELS AMONG US. Last night I met some of the ifish.net angels!! What do angels look like you ask? They are beautiful. They dropped off a truck load of wonderful presents for the children at Emanuel Hospital to have on Christmas. I have to tell you that it is an incredible experience to be on the end of all of that love and caring for our children. When I talk of angels people ask was there an Angel that led the rest, and I say "oh yes" and although we couldn't see her we felt the beauty of her presence. Her name is Jennie!! To all of the ifish.net family I want to say Happy Holidays to you and your families, and God Bless You for providing an incredible Christmas morning for our children who are so ill. May your fishing always be more than you hoped, and may you all be on the receiving end of as much love as you have given." It really is, "just like the Discovery Channel" here in Tillamook Oregon. Bill and I took a cruise down into tidewater yesterday. We were looking to sneak up on some early steelhead holding in tidewater but our efforts went unsatisfied. I spent the entire time bent over the gunwales of the boat, gazing into the clear water. I noted spawned out chum and chinook salmon by the dozen. More than I've ever seen before! The water was ten feet or more in depth, and clear as a bell! We saw mink and nutria, playing on logs, swimming around and splashing in the sunshine. They weren't working, they were playing! We found ourselves laughing as we watched. We silently rounded a bend, only to find a heron taking off, squawking to escape us. Eagles soared overhead, searching for food. An occasional shot rang out around us, as duck hunters looked for their dinner. Then, it was home, to run Kilchis on the river. I counted the chum in the upper hole. There were more than 30, finning silently below a riffle. Kilchis ran near them and spooked them. They took off, through the slow water, and I followed. Weakened by their physical state, they were sucked up near what we call "the falls" and then in a flash, all but one lone chum were sucked into the white water. I followed them again. In the turbulence, below the falls, the water is usually a deep green. Yesterday, it was still green, but in the deep pool below the falls there must have been 100 chums! It was a Kitchenaid mixing bowl of churning clear water with fins and flashing silver and white spots! I sat still and gazed for a long time. This is flipping amazing! It makes me want to invite everyone over to look! I have taken my fly rod down to the river a couple of times in the past week. I have spotted a steelhead in the deep pool, and I'd like to hook him. I came here fully intending to throw a fly, but instead stand in salute, still and straight, with my fly rod behind me, witnessing the miracle of the life of the chum salmon. With the low clear water that I have bemoaned for weeks, I realize that I have been given a blessing. I have never so intimately witnessed the ending days of a salmon's life. The returns are huge this year. What if the rains would have been more plentiful, and the river conditions more healthy? What if there wasn't a hint of a moderate El Nino? The run in four or five years would be tremendous! Instead, my hopes are for a somewhat normal return. The low water, the floods, the El Nino, it's just nature's job to curb overpopulation. Nature just doesn't realize that we, as people, are putting in an effort to take over that job. I have worried about low water, about emergency closures. I get angry about snaggers, and people taking fish on their spawning beds. What, what, what can I do? The lack of rain is just nature, doing what it knows best. Somehow, it all works out in the end, regardless of what people do about it. I stand helplessly and hopefully, praying that the redds will be safe, and that this enormous run of chum salmon will have huge successes in their life goals. Last night, as I took Kilchis out for one last run, an owl screeched, and then hooted a low hooooot hoooooot hooooooooo. It echoed lonesome and calm, across the canyon walls. The seasons stretch from fall salmon, to steelhead, to springers and back. It is really quite like the Discovery Channel around here, but real life forces me to be more patient. Instead of a one hour show, it will take me four years of fish seasons (without commercials!) to see the results of the chum salmon's 2002 Fall efforts. Don't keep your hands in your pocket while walking on a slippery rocky river bank. It's not fun to fall if you don't have your hands to catch you. Most accidents happen close to home. This applies also, when you are "almost" to the other side, on the river while wading. If you are out of chewies and dog cookies, life just isn't the same. Just ask your dog. The only place I feel comfortable using the boat bathroom is on the Kilchis river. All other rivers pale in comparison. There are so many dying salmon in the river that I worry about when the water comes up and sweeps them downstream. Will there be a chum dam? I was going to go hunting today, again, with Bill. 4:45 is very early in the morning. I failed again. Bye Bill, have fun! Today, I am going to make Christmas candy and attempt to organize my shopping. Wish me luck! Infopop has come out with a new release. I am sitting back and watching Marty of steelheader.net try his version first. Thanks, Marty, for being the beta tester! I'll learn from you! Finally! I have had two very relaxing days and nights! Slept 9 hours each night! Whoooo hoooooo! I was so exhausted last night! I washed the sheets and what a luxury it was to crawl underneath! I didn't have any interruptions last night! No kids, (they went with Dad), and the dogs behaved all night, too! All that, plus RAIN in the forecast! It was supposed to start already, but we have none. I believe it is coming still, though! I believe! 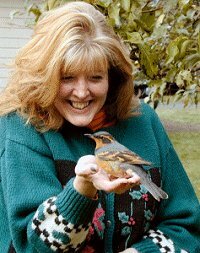 Yesterday, a varied thrush flew into the window, and I rushed outside to help. I couldn't find anyplace safe to perch it, while it regained it's balance, so I just propped him on my shoulder, and walked him around the yard. Bill got a kick out of that. He finally gained enough strength to fly away. Darnit, I should have put a leg band on him so I could identify him... I don't know if that's legal though. I've always thought about marking hummers when they come, so I could ID them later. Off I go... Bill wants to go hunt early steelies. I think I'll go along! Batten down the trampolines! The rain and the wind, they are coming!... and here Jim Erickson is in Hawaii. Geesh! Look what he is missing! The river is already up, but I'm panicking about Christmas! I have done next to nothing! Sure, I made some Russian Tea Cake cookies, and some pralines, but they didn't make it into baskets to give away. The kids and Bill polished them off as test batches. OK, they like them! So... what to do next? Make 10 batches! Whoooo hoooo, are they ever good! Thank you to Stan Fagerstrom for sending me a beautiful Angel pin! It is gorgeous and I have it on, right now! I have so much to do that... that... I'm going fishin! MUHAHAHAHHA! 80 MPH winds at the Hedlunds? That's what they said! 80 MPH winds at MY HOUSE. O.K., so they said at the headlands, but still.... The way the winds swirls in the canyon, it has to be dealt with accordingly. Sometimes it hits us almost like a tornado! The previous owners had their drift boat stripped from the tie down on the trailer and catapulted bow over stern the entire length of a football field and land in the river. Down, down, down the river it went! They did recover it, but it was mighty trashed! So, as I go outside in the wind, I always watch for flying drift boats! It's a scary world out here! When I was living alone in Astoria, I'd get really excited about these storms. A little afraid, too... Sometimes the wind would last for days, and I'd feel kind of trapped. This storm is supposed to be like that. Put the kettle on the wood stove, Jen. This has been a frustrating season. One day the steelhead are in, but the water is too low to drift. The next, the water is up, but you can't drift the river, because there are high winds! When will that perfect, ice cold, calm wind, green water day will be upon us? But for now, Bill and I have battened down the trampoline like you can't believe! Come on, wind! Just try and steal my tramp now! We have our big Columbia anchor out there and it will hold! The prongs are dug into the earth, and a rope tied to the bow of the dang thing! (It was tough on me, circling the tramp, trying to find the bow, and the stern!) This trampoline will hold anchor under the toughest wind current! Until then, the wind is still, the water is green, and there is a window of opportunity this morning for the most ardent, rain equipped steelheader! And that... I am one! On with my Frogg Toggs! Get out the pink pearls! It's time! No storm. Just buckets and buckets of rain. rain. rain. rain. rain. and more rain. Hmmm. Calm as can be outside. Almost eerie. Yet, I just received an emergency e mail alert that winds are already blowing to 60 mph. Again, I checked my weather station. Nada. No wind. I then walked outside. Nothing. So then I checked the Noaa wind gauge for Garibaldi, by clicking here. It is 6:26. Winds to 39 and windy. I went outside again. Nothing. This is strange! Where is MY wind? I guess we are protected in the canyon. I'll find out. Have to take David to school! That is the sound of bills coming in, to run ifish. 125.00 for the UBB 6.4 release, coming out soon. and then... the normal costs of operation. Sorry, kids... there will be no Christmas this year! Actually, that is not true. There will be Christmas, it just will happen thanks to the little plastic card I keep in my wallet! It has amazing ways of getting money to come out of walls. Today we are going to discuss steelhead behavior. It's when you get up in the morning and have a whole list of things to do. Things that you wrote the night before, things that you have put off. You write them down so you can quit thinking and worrying, and get some sleep. You look at the list in the morning, have some coffee, take a shower, get ready.... and then you look at the river. Dang, that river looks nice! ...and then the steelhead behavior kicks in. "I have nothing to do today!" "I am going to first try a bobber and jig, then I am going to try drifting, then, if the river is too high, we will just sit in the truck and plunk!" It's very scientific and difficult to understand the intricacies of steelhead behavior. But I am the master, you see. So... join along with me, will you? We'll learn all about it! We have until late spring to master the little details. Could you please let Andrew know that I won't be able to drive him to the orthodontist today? I have some steelies to study. I looked at the barometer. Oh my gosh! It was lower than 29! It is the lowest I have ever seen it and it keeps falling! Boys and girls, I'm a little nervous here! The scanner is going off constantly with downed trees and mudslides. I'm worried about my flowering cherry tree. The ground is totally saturated! The current warnings do not. I repeat, do not look good. Check for yourself! Three days of wind and rain! I filled the water containers, in case the electricity goes out. I have fire wood. I've battened down the tramp and the basketball hoop. Our power has flashed about 5 times so far now, and it hasn't even hit here yet! I was supposed to take Andrew to get fitted for a retainer. He got his braces off yesterday and he is so excited! I can't go. There is a mudslide by Neakahnie, complete with large boulders. Glad I wasn't there at the moment! I'm glad to be staying home. However.... David is at a friend's in Oceanside, and I get to go out there and pick him up. Ever been through a wind storm at Oceanside? That's where it hits hardest! Wish me luck! Well, wish us luck through the storm-- and you be careful too! Dang, I hope my pretty cherry tree doesn't go down! Oh my Gosh! We just had a tornado alert! Talk about anxiety attack! Yesterday morning, after not much sleep, I woke to that low, low, low barometer. It was just spooky! Then, on the scanner, the lady reports a "large tornado down at Grande Ronde, headed toward Tillamook." I heard it! I know I did! This, after watching a special on tornadoes the night before on The Learning Channel! I was more than spooked! "Bill? What do we do?" He said, "I'm not scared, I'm just irritated!" He had plans to go to Portland to see his Mother and now what was he to do? Leave me and the kids to go twirling into the sky? The thought of it now makes me giggle. A tornado in the canyon, huh, Jennie? Yeah, right! Surrounded by mountains.... uh huh. I didn't hear another word about that "tornado". Not on the news, not on the radio, not from anyone else. Still, the barometer that low was spooky. When I tapped it, this morning, it went up to 29.4. There is another high wind warning out, this time, they say, worse than the storm yesterday. I don't believe it. Barometers don't go up before a storm! Now watch. Oh me, of little faith. We'll probably have a dang tornado in the canyon today. If the weather people can't predict storms accurately, I sure can't. The river is blown out. The rain is pouring from the sky in buckets. 2.61 yesterday, and .45 since last night at six. I prayed for this rain, you know. Now, the steelhead are spread throughout the system, I'm sure. My prayers, now, are focused on not having a major flood. We had such a terrific return of spawning salmon, and I'm worried about my babies out there. Today, off to cut our tagged tree, before the winds hit. 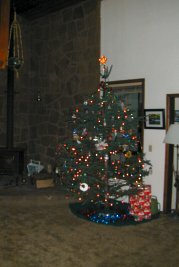 Bill and I finally drove up the Trask river, cut down our tree, and I decorated it! It is so beautiful! This pic doesn't give it justice. I decorated the tree mostly by myself. The kids kind of lazily walked by, grabbed an ornament now and then, and randomly placed it on the tree. David gave me a solid 10 minutes of his time. Then, he'd run off, joining Andrew with their activities, hidden in their bedrooms. I am old. Generations of memories came back to me, as I sorted through the box. Usually, I am picky. When the kids were young, they made the most frightening looking ornaments. I would praise them for their work, and hang them on the fridge, not the tree. This year, I proudly adorned the tree with most every piece of child's artwork I could find. With wild abandon, I used all the glittery-gold sequined paper ornaments that I could find, clear down to the bottom of the box! Little felt cutout stockings, that had their names glittered on them, paper angels... everything that glittered was gold! Things that made me smile 10 years ago, now brought waves of nostalgic emotion. My kids are past the age of Christmas magic! How can I bring it back? I tried! I picked out the biggest tree I could find! Ours is 10 feet tall, maybe more! I proudly displayed every last ornament that was ever created on every branch! As I sorted, I found ornaments that my piano students had given me through my teaching years. Piano ornaments, horns, treble clefs... my history of Christmas, all in one big box! ...and then, at the bottom of the box, I found the delicate ornaments that my Mother had given me from my own magical Christmases. Fragile pink hand blown glass harps, sitars and drums. I had never let the kids touch them, and always hung them high on the tree for protection. This year they are lower, and mixed in with everything else. When I was done, I plugged in the lights and stood back. For a passing moment, it all came back to me! It's magic! It's Christmas! I do! I do believe in Santa Clause!! I finished up the night by baking yet another batch of Russian teacakes, meant for gift boxing, but instead, polished off by the men in the family. What do I have to do? Hide them? And now, with the tree behind me, I am waiting for winter's first light, so that I can look at the river to see if it's fishable. With the pull of a bright chrome steelhead on my line, the Christmas season will be entirely magical! ... Just in a different way. Here is how I figure it. I get up in the morning, and it's dark. I can't see the river. I know from last night, that the water was a beautiful color, but had too much flow to drift the hot drifts properly. It was more of a plunking show. So, I check the Wilson River levels, by clicking on the front page of ifish, on the top, in the left hand column. The link is also here. There is no public gage on the Kilchis. The Wilson reading means to me that the Kilchis should be in prime shape today. Perhaps, still a little heavy on the CFS, but not bad! Glancing at my weather station, here, I see that it records .37 inches of rain, since 6:00 PM, last night. This sheds just a bit more morning light on things. So... whatcha going to do? It's up to you, but I know where I'll be! Hmmm. I see a drift boat trailer heading to the park. I gotta hurry! Dangit, I read the forecast data on the Wilson river levels, as if it were today. The Wilson has hardly dropped at all, and it is currently pouring down rain. It's up to .45 inches now and still coming down hard. :( I corrected my mistake earlier on the reading. I'm bummed. I had also had something shipped to Pete's house, in Portland, so that Bill wouldn't be suspicious. 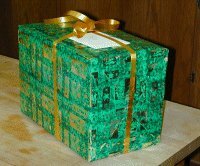 Anyway, he had a beautifully wrapped, big green box that he gave me. I shook it. I wiggled it. I don't know what it is! He says it is from all of you at ifish? Now how in the heck did you manage that? He told me it was Shane's idea. I can't open it until Christmas, and every time I walk by it, it just kills me! How many days till Christmas? The magic is back! Fishing reports around the area vary. I've heard of very few caught on the Kilchis, and a couple on the Wilson. If I am invited on a trip, I might go along, but yeesh, it gets busy this week! I fished out back yesterday, most of the morning, with not a single bite. Several crafts came by, and they reported poor luck, also. Today, my and I are going to drift the Kilchis. I will take a picture of my present, in the other seat of the drift boat, just to prove it to you. Yes, Jennie takes her present everywhere she goes. Hope it doesn't rain! I'll bring my present a rain coat, just in case. I knew that we were going, when I went to bed last night. Therefore, all night long I woke up with the question running through my brain, "Is it time yet?" Very little sleep, too much excitement! I've been too busy. I need rest! I need fish! I need drift trips! Lots and lots and lots of drift trips! The Wilson was just packed yesterday, I hear, and it's only going to get more busy with the oncoming week of Christmas vacations. Bill and I are going to put in right here, and drift down to the logging bridge. We can decide then, if we want to shuttle the second leg of the journey, to 101, when we get there. Kilchis and I had a blast yesterday, sitting on the lower bank, plunking. We only fished for an hour, but we both felt refreshed afterwards. I changed around the front page of ifish, so that I could fit our new OKUMA banner on ifish. Welcome Okuma reels to ifish! I'm pretty excited, because I've heard so much about their Metaloid reels, and I really want to try them for jig fishing. Yes, I took my present and drifted down the Kilchis yesterday. I still wonder what the heck is in that box, but whatever it is, I can assure you, I love it. It's been so long since I've drifted a river, I nearly forgot why I love it so much. It's not all in the hookups, let me tell you. It's a lesson in the wonder of life, and a day full of surprises. We were pleased with the escapement, this year, on the Kilchis. Dead salmon were everywhere! Littering the banks, on the bottom of the river, and hanging in the trees. Seagulls flocked the banks, feeding on carcasses, and eagles flew overhead. Bill and I set the anchor to pull plugs in one beautiful steelhead hole. Right beside the boat, a 40 to 50 pound salmon came to visit! It was like a Disney thing. This particular salmon came so close that I reached down to touch her side. She didn't move. She seemed to enjoy our company. She just hung next to us in the current, as if to gain strength. You passed me at the jaws, while you were chrome bright, with sea lice attached to your sides. You were strong, beautiful, and on a mission. You passed up my herring at the Ghost Hole. My spinner just made you laugh. You sniffed at my eggs and shrimp scent, as you mulled around the deepest hole in the Kilchis, and yet you resisted. You saw us there several times, as the water levels dropped. You became frustrated, wanting nothing but to get upstream. You started to become annoyed by all of the splashing bobbers around you. Out of boredom, you wanted to attack one of those baits, yet still, you held out. You had plans, and nothing would deter you. You finally grew weary of waiting for the rain, and in the middle of one cold, starry night, you fought to get over the shallow riffles. In the morning light, you sought comfort in a deep hole under a bridge. Soon, anglers gathered on the bank. Anglers by the scores lined the hole, and surrounded you, throwing hooks and corkies and big lead weights. The days were long and filled with terror. Somehow, you made it through them. The rains finally came, and like a breath of fresh air, you were able to escape and travel to where you were called. Days and days of heavy rain forced you to cling to the shallow waters near the bank. Debris floated downstream, as your gills fought to stay clean. Breathing was laborious. Finally, finally.... you knew. It was the scent in the river. That familiar creek that runs into your home river was near. It is time for you to drop your eggs, and make sure your species continue. Your body was tired. You were lean now, dull in color, and lacking the energy you once had, when you were in salt water. But you dug your redds, while menacing eagles flew overhead. ...and now, dear salmon, you hang suspended and spent, near death, by the side of my boat. Oh! When I am ready to die, if only I can be as satisfied with my life as you must be with yours! To be as useful, as selfless, as driven! As Bill pulled anchor, the current from one delicate oar stroke was too much for the salmon to take. She turned on her side and gave up life, to settle on the bottom of the stream bed. Because of this one hen's determination, God willing, you and I will witness the miracle of her life in the years to come, as we frequent this river as appreciative anglers. And I, with an ever increasing amazement for the life around me. Drifting in a winter wonderland! Stan Fagerstrom shared with me a poem, written by a friend of his, Edward Kryger. He read it to me over the phone, and it touched me. I have copied it for you here. Yesterday was a day of failed attempts on so many fronts! I did get a lot done, in the end, but it wasn't things I had planned on doing! I put up winter specials for two web page clients. I did a little last minute shopping. I managed to get presents to people on time, or so say the postal people. I stood in line at the Post Office for nearly 1/2 hour! In Tillamook! Can you believe that? I was going to go down the lower Kilchis and look for ducks with Bill. We put the sled in and the battery was dead. ARGH. Home we went, and it wasn't long before both of us were busy doing other things. Today, we might do a drift trip instead. It is Christmas Eve and Christ is born! The song, "He Lives! He Lives!" keeps going through my head. This is a good thing! Because, if he didn't live, this earth would be a mighty frustrating place for me! I honestly don't know how people manage life on earth without Him. 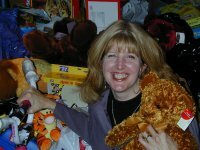 I tried, really hard to make Christmas magical for the kids, by buying gifts that will please them. The greatest gift I can give them, however, is His safe harbor that I have learned to lean on and gain strength in. My life is good, as long as I remember to put Him first. Tonight, we will light the Christmas lights, burn the candles, sit down to dinner and read the story that makes Christmas all come true. buried, dead three days and ascended into heaven. and to you, dear friend, Merry Christmas! My life with my , and taking pictures of me and my , isn't going as planned, but I can assure you, it has a very near and dear place in my life, also! I will tell you what is in the green box tomorrow. I know you all won't be able to sleep tonight, crazy with wonder. I won't either! Click here to see what the ifishers surprised me with! What a crazy morning! I got so many pairs of pliers I will never run out! Pliers for everything! And a Columbia fly vest, and hooks, and line, and bath stuff and lotions and tied leaders (cuz I can't see close up anymore!) and a fly reel that I think I should put in a lock box at the bank, and hand warmers and an Eddie Bauer sweater and... and.... I love Christmas!!!! Ah.... the day after Christmas. I love it! No one visiting... No one here... Just me and the dogs, the kids, Bill... and the river! Finally, the rush is over, and I can reflect on what it is really all about. It felt so good to go to sleep last night, knowing that all my shopping was done, that I hadn't messed up and forgotten anything, and everyone was happy with their gifts. Dinner with my family was very enjoyable. The drive was peaceful. Life is good. I got up early this morning, and went out to fish with a drift rig. I didn't get anything at all, but it was really nice having Kilchis out, running and wagging his tail. The air was cold and still, and the water rushing all around me was refreshing. Freezing, I went in the house to warm up, and catch up on some chores. I cleaned up all my steelhead gear, put away my new Christmas fishing toys... and then put my new reel on my TH fly fishing rod. What do you think I did then? I sat down with Bill and we went through all of my flies! We put cutthroat flies in one box, summer rainbows in another. Summer steelies and finally, winter steelhead flies! Into my new vest they went! Shortly thereafter, still in my pajamas, but with a down coat and a new fishing vest, I was out on the river casting flies! I love to fly fish! I tried 3 known fish producing flies in different holding areas, all to no avail. Still, I loved being out there, and my Lamson reel is as smooth as silk! I can cast with this new steelhead line clear across the river! Whooo hoo! Kilchis and I had a great time on round two of fishing the Kilchis. Back into the house to warm up, take a shower, and off into town to mail out some packages. Soon I was home and the river called my name, yet again. What now? Jigs! I hadn't tried jigs! I thoroughly worked the entire stretch of river, from one end of the property to the other. I had no shrimp tails, so I just used fishy looking pink 1/8th ounce jigs in all the hottest spots. No luck. Oh well, back to the house to work on web stuff. I got tired of that. Bill had to run to town, so I asked him to pick up some shrimp. I got antsy waiting for him, so I began to think.... Gosh, I hadn't tried spinners this year for steelies. So, I got out my 1143, and my Stradic reel, and started to cast spinners. I tried every spinner I had from Metrics to Blue Foxes. Nada. Not a bite, nor a twitch nor a bump. Hmmmm. Well, it's getting towards dinner time, and I'm getting a little bored just sitting around waiting for the storm to come in. I think it's time to prepare the shrimp. The sand shrimp. I'm going to combine it with a corky and a light slinky and try it at the lower hole. Wonder who will cook dinner? Good thing I slept alot the night before, because last night I was up most of the night, due to the wind! Click here to see the 60 mph gusts! It sounded like the house was going to get blown into the river! You can hear it coming down the canyon and then boom! It hits the house broadside! Kind of fun and exciting, though. Kilchis loves going out in it! I'm afraid he'll get picked up and twirled away like Toto!! I think I'll never eat clams again. No one else is sick, but I was up all night, violently ill. I think I consumed every kind of stomach medicine in the house, to no avail. Slept in till nearly 8::00, but I was up all night. Yuck... and Bill and I had plans to drift the Wilson. Bummage. I have been feeling pretty cocky lately. People have been dropping over with the sneezes and the sore throats, and I've held out. Me and my "Wellness Formula," which I get from Fred Meyers, will escape any disease!! I love that stuff! It's a vitamin supplement made by Source Naturals that I've taken for years to boost my immune system. Well... Night before last I was up sick all night. Yesterday, I got up and went fishing with Bill, anyhow. Then... it happened. My throat clogged up, I began to sniffle and sneeze. My body began to ache. Last night, mid dinner preparation, a feverish flush came over me. I told Bill as I brushed by him to go upstairs, "I'm going to bed". The roast was half done. The potatoes boiled on the stove. The green beans, still in the frozen bag. He just stood there, with a look of shock on his face. I imagined it to be the same look you'd see if he witnessed me fighting a huge fish, and I simply handed it to him, and walked away. "She must be really sick!". I bet it wouldn't have happened if I'd have hooked a fish. Frankly, I did hook two, but they both came unbuttoned. The first one, I was holding the rod. It felt so good! I told Bill, "It's OK! I don't mind missing it! I'd rather feel him bite, than have it in the rod holder and reel him in!" Maybe I lied. It is true, you know. I do love to feel the bite! It's what it is all about for me. So, why? Why am I sick? Mom's don't get sick, you know. People who cook dinner for the family don't walk out, mid preparation. Mom's fish during the day, and cook by night. They drive you places and are always there to do the things you don't feel like doing. It is enough of an oddity that I occasionally have surgery and am out for a while. But, sick too? Once when Andrew was very young, perhaps three, he was playing house with a little girl from our church. He wrapped his arm around her, standing beside the tiny plastic kitchen set, and said, "Honey, you go out and catch a fish. I'll stay home and fix dinner." I'm going to introduce this idea to Bill, later today. Of course, I'll have to do my part, too. Sick or not, I am the Mother. I'll simply have to brave the world, and go fishing.... sick, or not. I'd hate to let the kids down. Can you believe that I am going fishing with a 100 degree temp, plugged ears and a sore throat? That makes me super Mom!